I am a beekeeper, and I primarily sell my honey wholesale to stores. For most of the stores, I deliver cases of honey with no price tags. I let the store deal with that. I have one store that insists on being a pain. They have over 300 suppliers of local products on consignment, and everything is on a computer inventory system. When I started selling there, I was required to put price tags on with a regular price tag gun, and to also put a 4 digit SKU code on the price tag. The cashier just enters the 4 digit code into the cash register computer – the customer is charged the correct price, and it also adjusts the inventory and sales records. The store has a brilliant marketing idea, and they have a great location in a huge shopping center. (50K people a day visit this shopping center.) And they just opened up a 2nd store at another shopping center that just got built. But the store has serious management problems. They have hired too many people because they were friends, instead of hiring workers based upon competency. As a result, the cashiers are incredibly slow. I’ve seen them take 5 minutes to ring out customers when it should have taken less than a minute. (I used to be an assistant manager of a gas station when I was 20, so I know how quickly you can clear a line of customers.) The owner knows there are problems with checkout times. They have been encouraging vendors to put bar code price tags on items to help speed up checkout times. Starting 1/31/16, the bar codes will now be mandatory. If they didn’t sell so much honey, I would tell them to go pound sand and not sell honey there anymore. As it is, I made over $600 last month. (Most of the stores I sell to, buy about $300 a month from me.) My problem is that I am technologically impaired. (I grew up without a tv or telephone.) I still use a flip phone and don’t have a tv. I don’t have an Ipad or laptop – my computer is a desktop, and desktop computers have served me well for 15 years. I have the labels for my honey bottles custom printed. The people at the store tried telling me some gibberish about how to print my own bar code labels, but they might as well have been talking Greek to me. Does anyone have any experience printing bar code labels? Or is anyone interested in some work printing some bar code labels for me? I need 3 different bar codes for the 3 sizes of honey I sell at that store. (12 oz $7.00, 16 oz $9.00, and 32 oz $16.00.) I would probably only be buying 1000-2000 labels a year. I am currently paying around 14 cents a label for glossy, color labels for my honey bottles. I only need a basic black and white bar code label that I can stick on my bottles. The store that sells my honey calls itself a small business incubator. I considered asking management to ask other vendors if they were interested in printing labels for other vendors (like me) who are technologically impaired, and have absolutely no interest in printing my own labels. But I thought I would ask you all first, and see if anyone here was interested in some work. I don’t do bitcoin, but I do PayPal or can mail a check. Want to learn the art of successful speculation? Join Rick Rule, Lobo Tiggre and Leanne Baker as they mentor a Liberty.me member and CYCLE student on how to get started and succeed in speculative investing. Not everyone wants to be a speculator but this discussion promises to dispense wisdom that will be useful to everyone. Bring your questions and join the chat. Join veteran investors Albert Lu and Jayant Bhandari as they talk in the run-up to the Sprott Natural Resource Symposium in Vancouver. 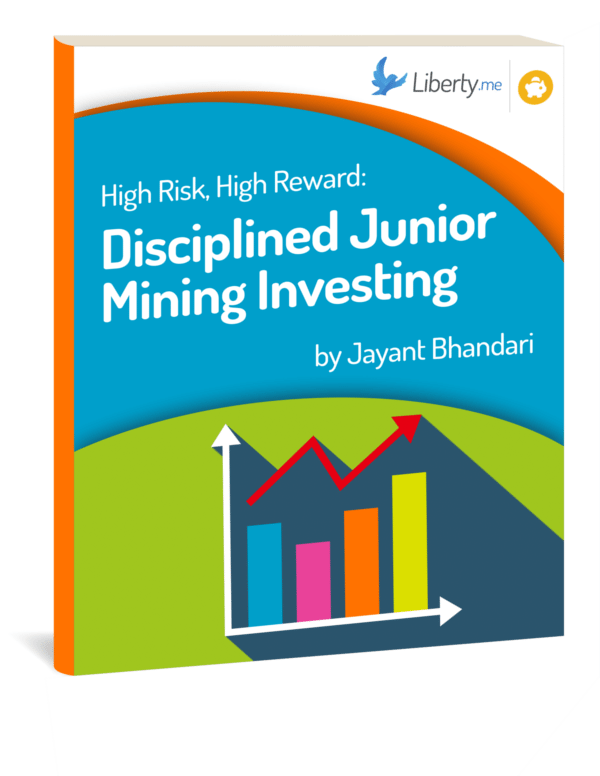 Jayant is the author of a new guide on Liberty.me called High Risk, High Reward: Disciplined Junior Mining Investing. In it, he shares some key advice for how to keep your head (and multiply your money) in the investing world. Jayant also brings a wealth of stunning stories about people who lost their heads and their money — in expensive strip clubs in third-world countries, in gold mines that can't sell any gold, and above all, on fraudulent and foolish irrational ideas. Liberty.me members can download High Risk, High Reward for free. Jayant is the organizer of the Capitalism and Morality conference. Check out his blog and his podcast too. And take a listen to Albert Lu's Power and Market Report on Liberty.me. What exactly is junior mining investment and what are its prospects? Can it be a useful tool in your investing arsenal? Successful investor and entrepreneur Rick Rule gives his thoughts. Contents will include in-depth instruction on valuation and other aspects of investing. Join Rick August 13th and 20th and September 3rd and 8th for this exciting four-session course. Legendary investor and entrepreneur Rick Rule dives into Session #3 of his Shark Tank series by teaching you how to do what he does. Learn the questions to ask executives and the theory behind how you approach the data. Contents will include in-depth instruction on valuation and other aspects of investing. What are the keys to sound investment and growing your money? Everyone's got a plan; there are whole sections at your local bookstore (and thousands of texts available online) telling you what you should do with your money, but they can't all be right. What are the fundamentals you should understand? This exclusive session with legendary investor Rick Rule will help you build the foundations for your future. Join Rick at 9:30pm EDT on July 2nd for this can't-miss event.